Michael Lee and Criket van het Berkenmeer made the Thai team very proud with a score of 267 including a 91 in protection. 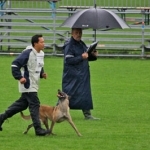 Criket had the 4th highest score of all the female dogs in the World Championships and was the highest scoring dog from Asia in the Championships in Schwanenstadt. Bert Kikkert and Cartouche van Beukenhage scored a very respectable 252.